Sydney: Australia were 6/0 as the bad light and poor weather forced early stumps on the fourth day of the fourth and final test on Sunday. Usman Khawaja (4*) and Marcus Harris (2*) were at the crease as Australia concluded the day at six without loss, trailing India by 316 runs. Day four had begun half an hour early to make up for the overs lost on Saturday, but it made no difference. Rain washed out the whole first session – and when it wasn’t raining, it was bad light delaying the start. India enforced a follow-on against Australia in a rain-marred day four of the fourth Test. This is for the first time in 30 years that Australia are following on at home. Last time they had to follow-on Down Under in a Test match against England in 1988. Australia, resuming at 6-236, quickly lost their wickets as India wrapped up hosts for 300, with a lead of 322 runs. Due to poor weather and bad light just 25 overs bowled on Sunday. 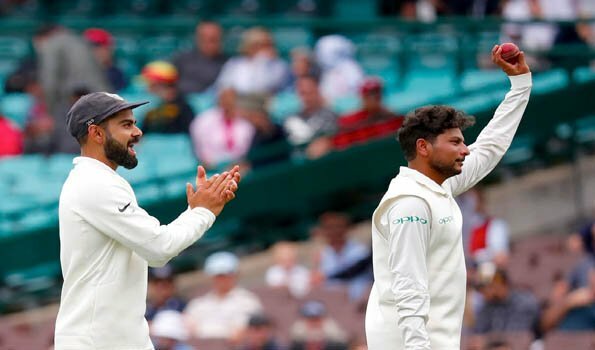 Kuldeep Yadav picked up five wickets, his second five-wicket haul in Test cricket. Ravindra Jadeja and Mohammed Shami took two wickets each, while Jasprit Bumrah dismissed Peter Handscomb (37) to join the party. Opener Marcus Harris blazed a career-best 79 to lead Australia’s fight on day three. However, prominent batsmen Usman Khawaja, Shaun Marsh and Tim Paine failed to deliver. As stumps on Saturday, Australia were 236/6 in 83.3 overs as the umpires took the players off the field due to deteriorating lighting condition. Peter Handscomb and Pat Cummins were at the crease with four wickets in hand to save the Test match. After lunch, Australia were 198/5 at tea. Spinners put India on top as Kuldeep Yadav claimed three wickets and Ravindra Jadeja took two scalps. Though Australia got off to a good start, but lost their momentum and India took complete control by the end of the first two sessions.